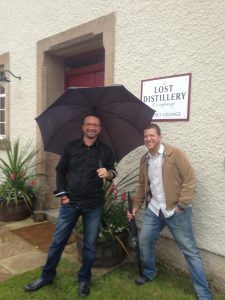 Hard to believe that the last quarter of the year is here and it seems ages ago that it was time to head back to Scotland to oversee the last rites on the 3rd edition Scotch Whisky Advent Calendar. 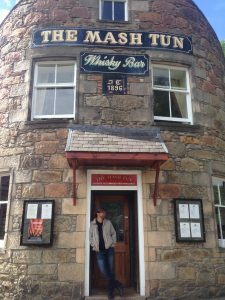 This time the trip took a twist with Joshua Hatton from Single Cask Nation meeting up with me for a trip to Speyside and a cask tasting or two. 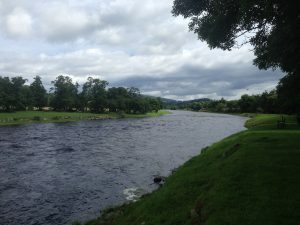 Having never been to Speyside before I was excited to say the least. Having been to Scotland half a dozen times I was well past due to get up North and experience more of the spectacular Scottish countryside. 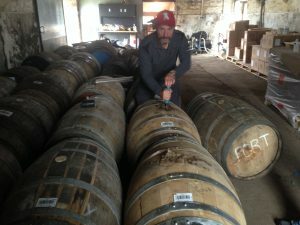 Making some new friends while pulling wooden bungs out of barrels is awesome. 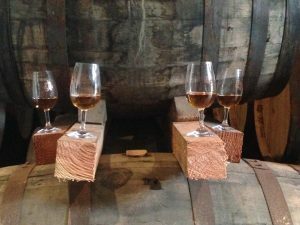 There will be some amazing whiskies around the corner for the 4th edition as a result and those who are members of Single Cask Nation can anticipate some exceptional bottles. A huge thanks to David Stirk of Exclusive Malts for taking us through his warehouse and providing our first amazing meal of the trip complete with what was to be the first of many pints. Our first night was absolutely one to remember as we were literally spoilt rotten at the hands of the Crucial Drinks crew. 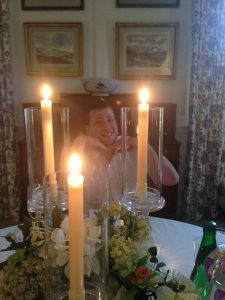 Treated to a private dinner in the magnificent Dumfries House, a seemingly endless array of courses were presented alongside paired wines and fun conversation. 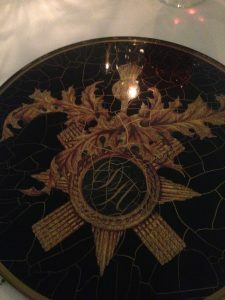 It would have to rank right up there in my top 10 list for dinner experiences in my 40+ years. 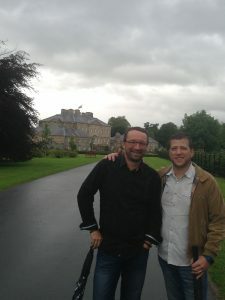 The tour of this fully restored mansion with Champagne glass in hand was only topped by the incredible service. It was to date the most outstanding attention I have ever received in Scotland and I can’t impress upon you all enough that if you get a chance to visit Dumfries House don’t miss it. Drams and tales in the bar after topped off an absolutely epic evening. Thanks so much Brian, Scott and Ewan for making our first day on the trip one to remember. Cruising through the Heather covered hills of the Carn Gorms National Park next morning was glorious and with the sun making some brief appearances spotlighting a patchwork of purple and green I indeed wondered why I had never ventured North before. 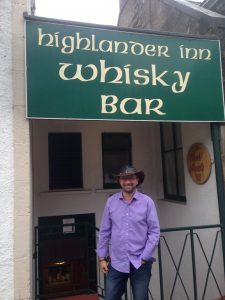 Elgin was the destination but not before a wee stop at the Highland Bar for a dram and a pint (see a pattern forming here). 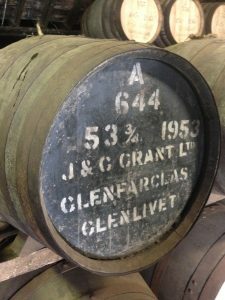 Glenfarclas was the first distillery visit and the absolute highlight of not only this trip but my entire whisky experience was a sneak into the Family Cask warehouse where Callum proceeded to dip his magic whisky wand into the 1953 cask. Upon giving the sample to Joshua he claimed that it had been a while and a refresher nosing was in order. Joshua quickly complied handing the glass back to Callum who promptly sniffed then dumped it back into the barrel. The look on Joshua’s face was something akin to how he might look while watching a particularly gripping horror movie. Callum fully reveling in his fun dipped back in and replenished the glass for both of us to have not only a nose but a precious taste. 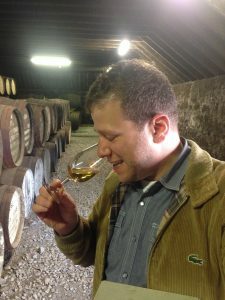 I have had many older whiskies some of which have been amazing and some that have been disappointing. This was neither, as amazing would not do it justice. 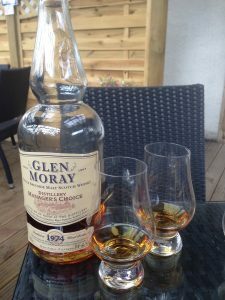 It was without doubt the best older whisky expression I have ever had and at 63 years of age I could scarcely believe the soft fruits and balance. This was one expensive dram and I savored the moment. 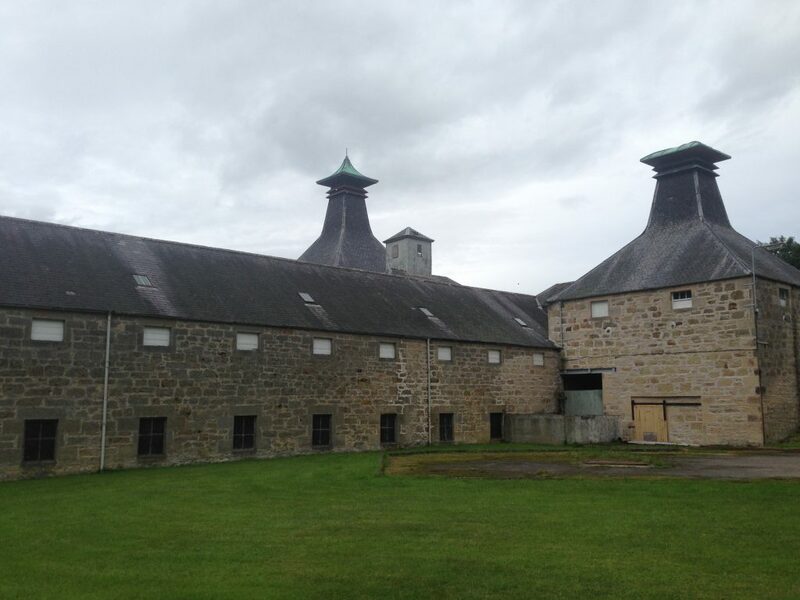 It could be the setting added to the effect but why not it’s a rare experience to delve into such old and scarce whisky. Next distillery on the docket after a fabulous lunch (and a pint) at The Mash Tun was Glen Moray and the tour with Ian was fantastic. 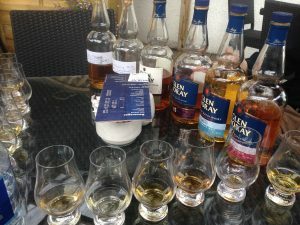 Glen Moray has been a favorite of mine and the 6 whisky tasting lineup at the end was everything I have come to love about Glen Moray and more. Dinner, pints, drams and cigars with Ian, Joshua and Ronnie capped off another perfect day of whisky adventure in Speyside. Week one came to a close all too quickly and it was time to have a last evening with Joshua on “the mile” at the fringe festival with my good mate James Cowan and Jennifer Nickerson. The Edinburgh festival is really fun and any chance to be part of the buzz in such a beautiful city is a must. With Joshua winging back to the States it was time to roll up the sleeves and do some actual work. Stay tuned for part two.